Eindhoven is a modern city with a strong high-tech tradition and a drive for innovation. There are excellent cultural, commercial and living facilities in the city itself, and in the surrounding towns and villages. The city has its own international airport and Schiphol Airport is within easy reach. As the largest city in the south of the Netherlands, with approximately 210,000 inhabitants, Eindhoven is the fifth city of the Netherlands. However the economy of the Eindhoven region is the second largest in the Netherlands. The Eindhoven region is widely regarded as one of the high tech hotspots in Europe. Eindhoven received its city rights in 1232. At the end of the nineteenth century, Philips established its lamps factory, because of that Eindhoven is also called the ‘City of Light’. Is much as forty percent of Dutch investments in Research and Development, are spent in this region. The Technische Universiteit Eindhoven ranks among the best worldwide. Eindhoven is a green city, with outstretched parks and far more trees than the four largest cities of our country. Together with the Port of Rotterdam and Schiphol Airport, the Eindhoven region is one of the three mainports in the Netherlands. The city is more than justified in calling itself ‘Brainport’. 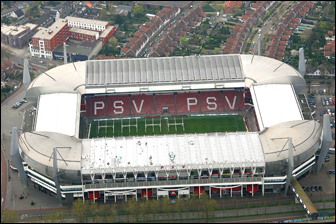 Eindhoven is a city of sports: besides PSV's football team, at the Philipsstadion, the area also excels in swimming, horse riding, hockey fields, ice rinks, an indoor ski and snowboard centre.